ASUS is no stranger to the Android tablet market. They've been around since the earliest days of Android tablets with their ASUS Transformer TF101 which launched with Android Honeycomb. Since that time they've released a number of iterations of the ASUS Transformer Android tablet, and have also expanded to other parts of the market with tablets like the ASUS MeMO Pad. In addition to their independent endeavors, they worked with Google to design and manufacture both generations of the Nexus 7, which was beloved by Android enthusiasts. While ASUS has been making Android tablets for a while, it has also been quite some time since we've seen a high end tablet come from the company. A focus on expansion into the world of Windows tablets has left the spot for a high end ASUS tablet unfilled. However, with a renewed focus on expanding their role as an Android manufacturer, and global ambitions with devices like the ZenFone 2, it was only a matter of time before ASUS brought new Android tablets to market. It also seemed inevitable that those devices would now fall under ASUS's Zen branding, and indeed, they do. 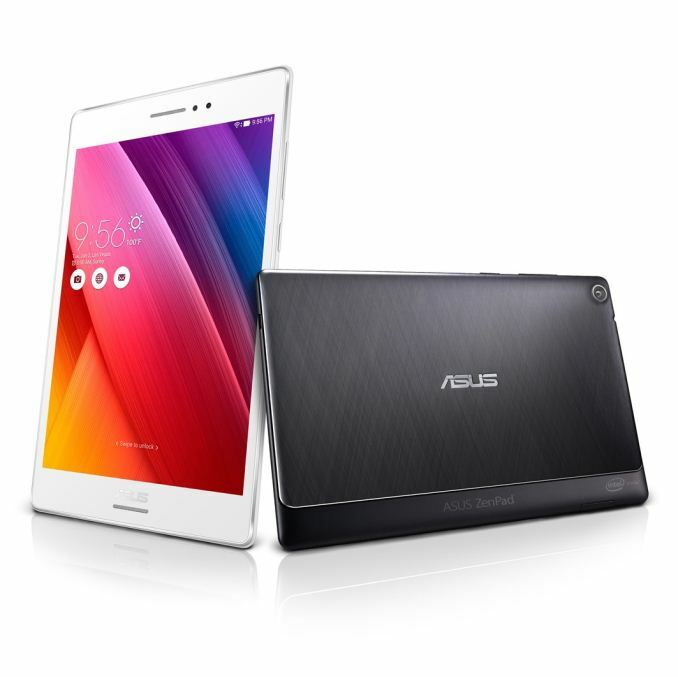 ASUS's new Android tablets are the first in a line of tablets under the ZenPad brand. To put things in perspective and make it easier to compare these two new tablets, I've organized their general specifications in the chart below. There are a few things missing at the moment as they haven't yet been provided by ASUS, but I will update the chart and this article as soon as they are known. With this launch it appears that ASUS is putting devices into play at both the high end and the low end of the tablet market. The ZenPad Z380 is certainly the thicker of the two devices, and it's slightly shorter but with a much more narrow profile. You can see the ZenPad Z380 pictured in the cover image above, and the ZenPad S Z580CA is down below. While the Z380 opts for swappable leather textured backs, the Z580CA has a non-removable metallic back, although it's unknown if it's actually made of metal. I'll start by talking about the Z380 before moving onto the Z580CA. The first thing I noticed about the ZenPad Z380 was that it uses the Intel Atom x3-C3230RK SoC. This is a very interesting chip, because the RK on the end of the name signifies that it's a chip designed by Rockchip rather than Intel. Through their partnership, Intel licenses their architecture to Rockchip to use in the SoCs they design, and those SoCs are then fabricated on TSMC's 28nm process. It's a surprising collaboration of three companies. Atom x3-C3230RK has four of Intel's Silvermont cores and they have a peak frequency of 1.2GHz. This puts it pretty far behind Intel's higher clocked Moorefield parts that are built on their 22nm manufacturing process when it comes to bursty workloads. However, the size of the gap between it and Moorefield will be in a sustained load when both SoCs throttle down remains to be seen. It also sports ARM's Mali 450 GPU with four cores, although the clock speed on those GPU cores is unknown. Moving on from the SoC, we see that the ZenPad Z380 comes with either 8GB or 16GB of internal memory, and 1GB or 2GB of RAM. According to ASUS, these specs can vary based on region, so be sure to take a look at the spec sheet if you plan on buying the Z380. It also has an 8" 1280x800 IPS LCD which is fairly standard for a low end tablet, and a pair of 2MP and 5MP cameras on the front and back respectively. After the ZenPad Z380 comes the high end ZenPad S Z580CA, which is also a tablet with an 8" display. However, the fact that both of these tablets have the same display size as measured from corner to corner does not mean they have the same form. This is because the ZenPad S uses an 8" 2048x1536 IPS panel which has a 4:3 aspect ratio. ASUS is following HTC and Samsung in moving to 4:3 after many years of 16:10 Android tablets. I'm surprised that it took this long for vendors to realize that 16:10 is ill suited to many of the tasks users perform on tablets and makes a device more difficult to manage in varying orientations. 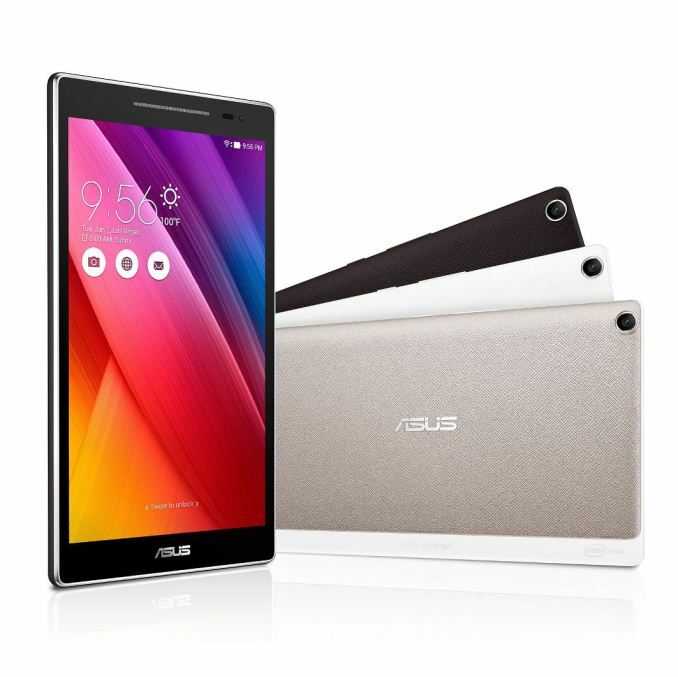 The rest of the internal specifications of the ZenPad S are very similar to those of ASUS's ZenFone 2. It uses Intel's Atom Z3580 SoC which is a 22nm part with four Silvermont cores that run at up to 2.33GHz, along with a PowerVR G6430 GPU at 533MHz. Other specs include up to 64GB of NAND, 4GB of LPDDR3 memory, a 5MP front camera, and an 8MP rear camera. Both of these new ZenPads share the same battery capacity, which is somewhat concerning when one considers that the display on the ZenPad S will most likely consume more power than the ZenPad Z380. They also share the same WiFi, and in both cases it's a very disappointing 2.4GHz 802.11n part. Although lackluster WiFi is not new to ASUS products on the laptop side with devices like the Zenbook UX305, the ZenFone 2's 802.11ac support had me hoping that this wouldn't extend to their mobile devices as well. While pricing for both these new tablets hasn't been revealed, the Z580CA is clearly aimed at the high end, and when your $199 ZenFone 2 has 802.11ac your high end tablet should too. There is one final thing that distinguishes the ZenPad S Z580CA from the Z380, as well as from almost any other tablet. It's the use of the new USB Type-C standard for charging and data connections, with no MicroUSB port available. This is probably going to be painful for some consumers as charging cables get lost or broken and can't be replaced with easily available MicroUSB cords, but it's a transition that needs to happen and I applaud ASUS for beginning it sooner rather than later. Using the Type-C port for connecting peripherals or doing display output will definitely be something to investigate if we do a review of the ZenPad Z580CA in the future. When Android M rolls around it will also be interesting to see if you can use the ZenPad Z580CA to charge another device. ASUS has also announced a range of accessories for these new tablets. The Z380 has protective cases available, and an audio cover that ASUS says enables 5.1 surround sound, powered by the ZenPad's build in DTS codec. There's also a power case to extend the tablet's battery capacity, and a 1024 pressure level stylus which works with both of the new ZenPad tablets. Overall I think ASUS has two very interesting devices on their hands. For me the ZenPad S is the most interesting of the two because of its hardware and USB Type-C connector, but the ZenPad Z380 could prove to be a formidable competitor to other inexpensive Android tablets depending on its price. Speaking of price, that's another aspect about these tablets that is currently unknown. Much of the success of these new tablets will be based on whether they provide a good value relative to their price. ASUS has a lot of competition, but if these tablets are priced right they could have a couple of winning tablets on their hands. Well, I suppose it`s still usable in most scenarios. Well, baytrail is about as fast as krait 400, yet drinks quite a bit more power, so TDP was never that good compared to ultramobile competitors. I was thinking the same thing. And honestly sporting a last gen chip on the eve of tomorrow makes me wonder if this is a higher end tablet. If it is then it's not that interesting I think. If it's actually like a $200 tablet then it gets a lot more interesting. Owning a N5/7 and having spread Qi pads around the house, the only time I ever plug in to charge anymore is in the car (mostly because I like my DIY universal mount better than any Qi enabled mount I've seen).